If you see traces of blood when brushing or flossing, this can be a sign of gum disease. If left untreated this may lead to bad breath, red and swollen gums, gums recession, loose teeth and ultimately tooth loss. 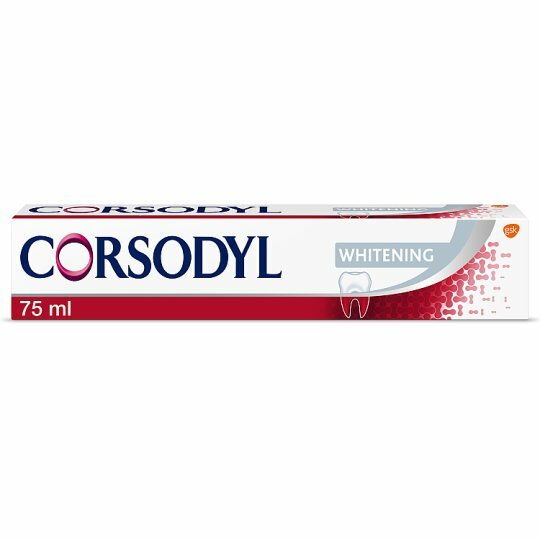 Corsodyl Whitening is a daily fluoride toothpaste that is clinically proven to help stop and prevent bleeding gums. Corsodyl toothpaste has a unique formulation which disrupts plaque bacteria along the gum line, enabling more plaque to be removed*. Its formulation removes more plaque than a regular toothpaste*. This product can also be used as a smoker's toothpaste. What is gum disease? Also known as gingivitis, gum disease affects at least 50% of adults. If you see traces of blood when brushing or flossing, this can be a sign of gum disease. If the plaque bacteria are not removed, bad breath, red and swollen gums, gums recession, loose teeth and ultimately tooth loss may occur. It has a unique formulation that gives it a therapeutic taste. Most people liked its unique taste after 14 days of using Corsodyl toothpaste. 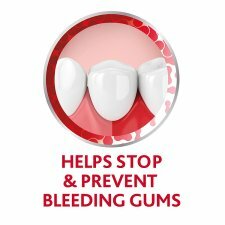 You can help stop the bleeding of your gums by brushing with Corsodyl Whitening toothpaste. Contains fluoride and is an SLS free toothpaste. You can use it every day with confidence. Under 100ml so suitable for use as a travel toothpaste. *Than a regular toothpaste not containing sodium bicarbonate. Not suitable for children under 12 years. Keep out of reach of children. If irritation occurs discontinue use. The ends of this carton have been glued down. Do not use if carton ends are open.